Brushstrokes: Interview with CoCo Artist Patrick L.
Flowered Tom and Jerry, by Patrick L.
Patrick: I have been an artist as long as I can remember. Specifically I fell in love with art in the fourth grade as well as with my art teacher Miss Gallo. It was love at first site on both accounts! I also remember my love of objects, antiques, and anything vintage. I eventually graduated with a Masters Degree from the San Francisco Art Institute in Lithography. Patrick: My work is rich with color and nuanced with a surface quality that is engaging. My love of paper, surface and collage continues to this day. Library or studio? Patrick L. draws inspiration from literature. Patrick: In my Seattle Studio, my images room surrounds me with hundreds of books and cuttings from pages of history books from various cultures, erotica from the Kama Sutra, original letters and journals, encyclopedias, old children’s books, and vintage wall paper. I am intrigued with the past and the associations that can be made with aged surfaces and vintage ephemera. My technique is to combine paint with collaged ephemera from these sources. 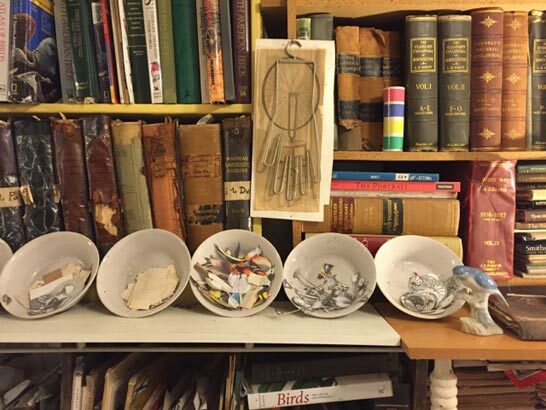 Patrick L. incorporates collage from vintage sources in his work, which is evident in his eclectic studio. Patrick: I love working on commissions, I love the challenge of being given a project to create what matches the client’s ideas and desires with my own creative vision. What is unique in my work is I am able to combine pictures or collage elements that the client provides of their family, memories and significant events and I incorporate them in a lasting work of art for them. I also have produced large-scale paintings for restaurants, hotels, hospitals, law offices, and ten years for major department stores nationally. Patrick L. enjoys matching the client's desires with his own creative vision. CoCo: Tell us about one of your favorite commissions. Patrick: One of my favorites is a client’s house, depicted as a cake. The client was a professional baker, and to make it personal, the windows of the house have family photos collaged in them. Another was for a client's wedding anniversary; she wanted two florals with an Italian background, and images of The Kamasutra collaged into the flowers. A commission by Patrick L. that uses original family photos in the windows.